Historic versions of the original architect’s drawings were found in the Boston Public Library. This allowed original concepts to be reinterpreted for the new design. In the main living space, bamboo floors cascade down the stair, and provide a light contrast to rich mahogany. Mahogany details link each floor by connecting handrail to mantelpiece to cabinets. We researched ship and train bathrooms to figure out how to insert a full bath in this tiny space. Here the body became a unit of measure. 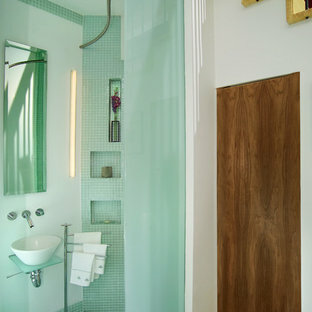 The addition of translucent laminated glass walls encloses the room. The glass walls provide privacy, but keep the adjacent bedroom open. 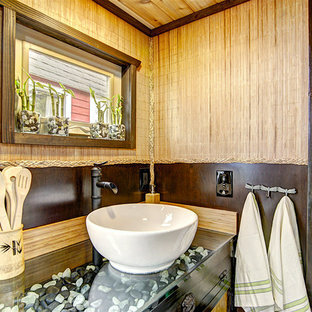 Vessel sink floating over black river rock, jade stones and twinkle lights. 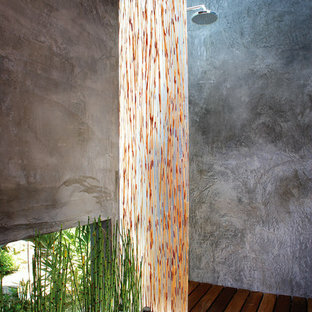 A custom Shoji screen door leads to the bathroom and bamboo wall covering carry out the Asian feel. 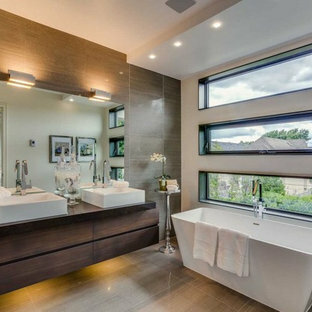 ASID Design Excellence First Place Residential – Kitchen and Bathroom: Michael Merrill Design Studio was approached three years ago by the homeowner to redesign her kitchen. Although she was dissatisfied with some aspects of her home, she still loved it dearly. As we discovered her passion for design, we began to rework her entire home--room by room, top to bottom. 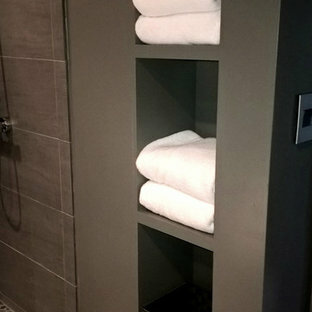 Handy cubbyholes built in to the wall next to the shower make a handy place to stick your towels for when you get out. 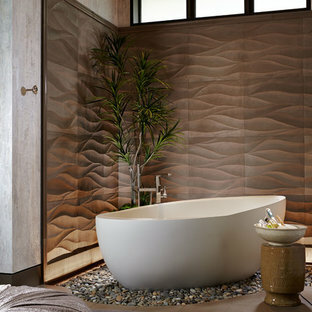 In this ultra modern bath, all hard surfaces are nano-glass. 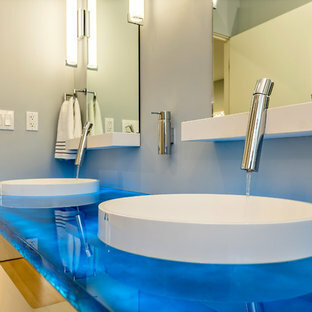 A small bathroom with a shower over the bath and a double vanity with fusion formed glass basins. The towel rail is at the end of the bath away from the shower. 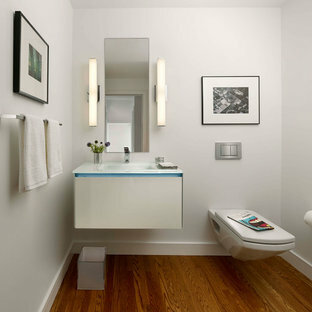 This is a good option in a small bathroom.